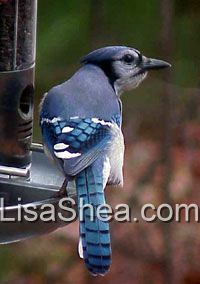 The Blue Jay is one of the more common birds in the US, and easily identifiable. 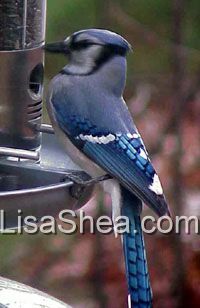 With its large body, its bright blue feathers and its loud voice, this bird can be drawn by quite a variety of food. While its overbearing personality lead some birders to drive them away in annoyance, they actually serve a vital part in the birding web of life.